Sue was elected to the NFWI Board in 2015. She is currently Chair of the Science & Leisure Committee and also sits on the Denman and Membership Development Committees. Sue has been a member of the WI for 40 years, first joining Quedgeley WI, where she served as Treasurer, in 1975. Subsequently she was President of Heron Park WI, and later Secretary of Twyer WI in Gloucestershire Federation, where she is still a member. She was a board member of Gloucestershire Federation from 2004 to 2013, during which time she took on various roles: press officer, Denman Ambassador, Vice Chairman, and then Chairman from 2011 to 2013. She was also a WI Adviser from 2008 to 2013. 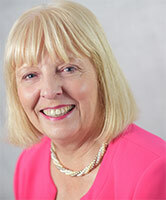 Sue was a Member Representative on the Denman committee from 2010 to 2013. She is also currently a Denman Guide. Sue worked for Midland Bank (now HSBC) from 1971 to 1984, before moving into local radio and working on BBC Radio Gloucestershire for 14 years from 1988 to 2002, presenting and producing daily and weekly programmes and documentaries. Sue's interests include horse racing, local history, travel, theatre, and puzzles. She is also a Gloucester Civic Trust Tour Guide and website manager, as well as Vice- President of Churchdown male voice choir.